I miss your writing, she texts me. So I went back and read a bunch of the old stuff. I miss it, too, I write back. “So are you writing?” she asks. The words hang in the air, thick and heavy as autumn clouds. I want to tell you other things. I want to tell you all the poets who are saving my life lately. Because you can’t be a writer unless you delight in words and the creators who craft them. I want to tell you how golden light in late afternoon halos the ringlets of my toddler’s hair into holy sun. Because you can’t be a writer unless you look into people’s faces and notice the play of light. I want to tell you how every week some conversation with some stranger startles me into the persistent presence of God. Because you can’t be a writer unless you learn how to spin a good story. I want to tell you how singing grace with my kids last week made me realize that – despite copious evidence to the contrary – God has given my life the only things that I need. Because you can’t be a writer unless you start to mine deeper truth beneath simple surface. I want to tell you all these things and more. I want to stop singing lament and start singing hope. I want to find new words where the old ones ring hollow. But how do I sing when the valley is still thick with bones? It is the weariness in the prophet’s voice that catches my throat, every time. His soul-weariness, looking out across the stark valley of scorched bones. Can these bones live, the heaps of death? He cannot shrug or scratch his head. He cannot cry in an acrid land; moisture dried up long ago. But he still answers God’s question. In his words alone he turns back. O Lord God. You know. Dry bones make a mocking valley where there should be mountains. The land itself is hollowed out. Bones, not bodies. Ash, not dreams. Dust, not earth. Nothing good can grow here. How long can you look before it wearies your words and dry your bones, too? The only response is exhausted: you know. O Lord. God. But even in bone-worn despair, there rises a wisp of faith. Trust turned into words – even if it is scraped from corners to make a small-enough pile to say something – is no small feat. It becomes the ground of possibility. The place from which God says, “Then…” Then is a word of invitation. Then is an arm outstretched to point forward. Then is a stirring to show the way. 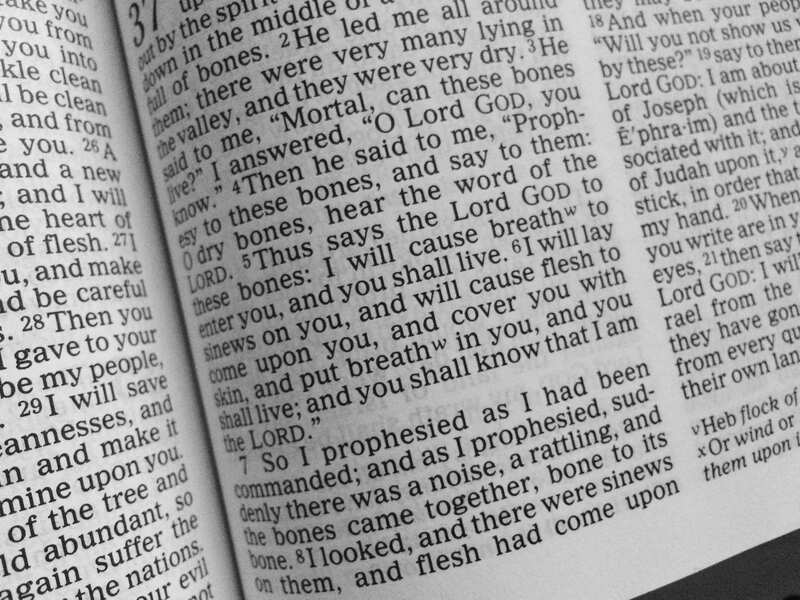 Then prophesy to the bones. Then prophesy to the breath. Then prophesy to the people. Tell hard truth. Tell what you see. Tell what you do not yet see. Speak suffering. Speak hope. Let the harsh winds of this dry valley sweep your life clean – of illusion, egoism, ease, desire to control. Then – then! – then you can become a voice in the valley. A sound in the silence. Then you can become an instrument: a hollowed-out beauty, a source of song from your emptiness. Then you can turn bones into flesh. But all this begins with bones. Driest your eyes have seen. And the words you want to speak, that you might live. This post is beautiful. Thank you for reminding me there is always hope, even amongst the bones and dust. God bless you and give you comfort. I am always so grateful for your gift with words. Thank you, Laura. God bless your heart. Sending much love.